To conclude molecular week here at GourmetMale I made a great little entree that you can make to impress your guests. It's a fair bit of work and you need to source some speciality ingredients but trust me, it's worth it! As with our Oyster with Passionfruit Foam, you'll need to pick up a couple things you wouldn't have in your pantry (if you do, you should be guest blogging here!). So, look online or check out a speciality cooking retailer near you - and pick up some sodium alginate and calcium chloride. You'll also need some soy lecithin but if you made the oyster dish you'll have some handy. Don't worry, these aren't as strange as they sound. First, make some rockmelon juice (about 250g). This will require you to peel and chop up half the rockmelon and then blend to a paste. Strain the paste to get the required amount of juice and set aside. Add 2.5g of calcium chloride to a bowl with 500g of water, dissolve and leave in the fridge. Then add 2g of sodium chloride to 1/3 of the juice and blend with a hand blender until completely dissolved. Then add the rest of the juice, blend and set aside. In a pan, boil the basil, milk, and water for a couple minutes. Take off the heat and let cool. Add 1g of lecithin and blend with a hand blender until the foam develops and then let stand. As you need to act quickly with the rockmelon caviar (they will harden after a few minutes and you will lose the explosive texture with the liquid) place the prosciutto on a serving platter and add a dollop of chevre to each one. Remove the calcium water from the fridge. Fill another bowl with clean, cold water. Fill a dropper with the melon mixture and drop into the calcium bath. Let stand for one minute and then carefully remove with a slotted spoon and rinse in the clean water. Add to the middle of the prosciutto, spoon on some basil foam, and serve. Your guests will be impressed! 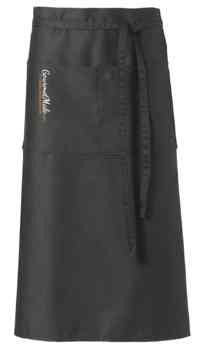 Pick up one of our new GourmetMale aprons!